When you are looking for call recording in Evansville, IN, trust Midwest Telecom Communications for the solution. 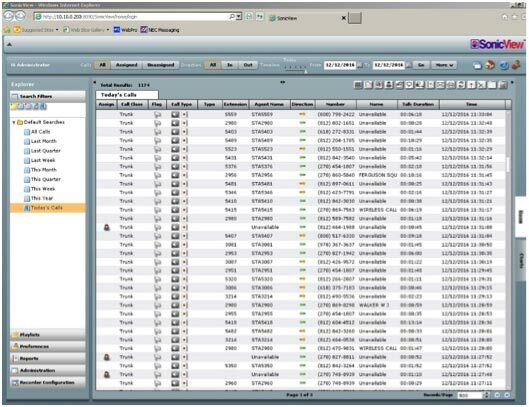 We offer SonicView Call Detail Recording & Reporting, which is an enterprise-grade recording platform available at very affordable price points. It provides the most comprehensive phone recording features and functionalities found in the marketplace today. SonicView can be configured as a trunk-side or a station-side recording platform. Its trunk-side supports T1, PRI, Analog, and SIP trunks and is PBX agnostic, making it a future-proof investment. Its station-side recording supports digital, analog, and IP phones. Whether configured as trunk-side or station-side, the software provides the same interface and works with any telecom service. SonicView provides a user-friendly, web-based interface making it easy to access recordings from any PC located on the network without needing to install any proprietary client applications. It is built using the latest architecture and provides a state-of-the-art user interface to improve ease-of-use and enhance user experience. Centralized Recordings from Multiple PBX/Locations. SonicView also offers a call scoring and agent evaluation module. This allows businesses to create various scoring templates and evaluate calls based on their choice of call detail reporting. Once scored, the system enables running multiple reports to assess your agent’s performance over a period or across various agents/departments. Used to coach, train, and evaluate agent performance and for quality monitoring. When combined with our other telecom services, these scored reports help to significantly improve the quality of service you provide to your customers. This, in turn, enhances customer satisfaction which helps to increase your retention and profits. If you regularly interact with customers over the phone, then having records of these interactions is essential for the success of your business. Detailed call logs give you information on the satisfaction of your customers and also give you the tools to evaluate the performance of your employees. These records are also useful for resolving disputes with your customers. Ensure you are getting the best call recordings in Evansville, TN, with the assistance of Midwest Telecom Communications. Our SonicView software gives high fidelity recordings of your phone calls and offers ease of use for playback. The recording is stored in an online database that is easily searchable from the web-based application and provides quick playback on any computer. This software also adds functionality for quality assurance and can be used to quickly parse the recordings to build reports. This allows you to quickly analyze your customer interactions and find problem areas that need fixing. To learn more about this call detail reporting or to explore our recording solutions, reach out to our office. Our team is always happy to answer your questions and help you with your recording needs. Contact us when you need a phone recording solution for your company. We proudly serve Evansville, TN, and the surrounding areas.